One of the most important elements of a new website is the navigation. 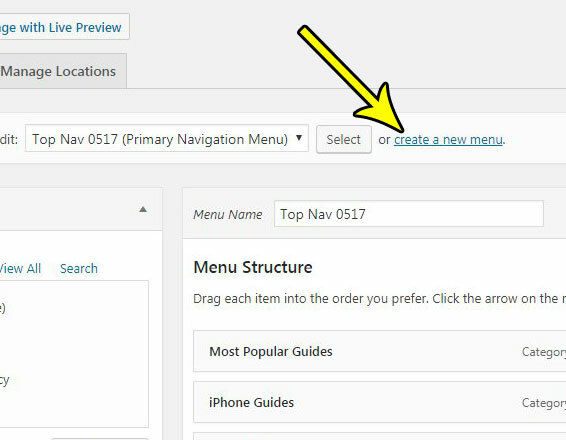 Good navigation can take several different forms, but most WordPress site owners will incorporate at least one menu into their site so that visitors can find their way around. But your new site probably doesn’t have a menu yet and, depending on your familiarity with WordPress, you may be having trouble figuring out how to get one set up. 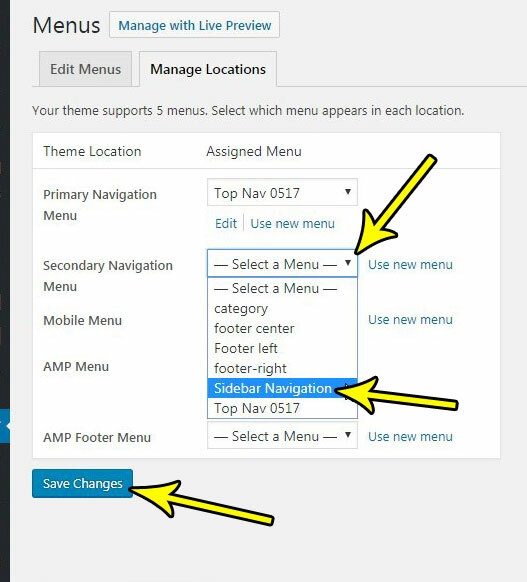 Our tutorial below will show you how to create a new menu, add links to it, then choose the location in your theme where you want that menu to go. 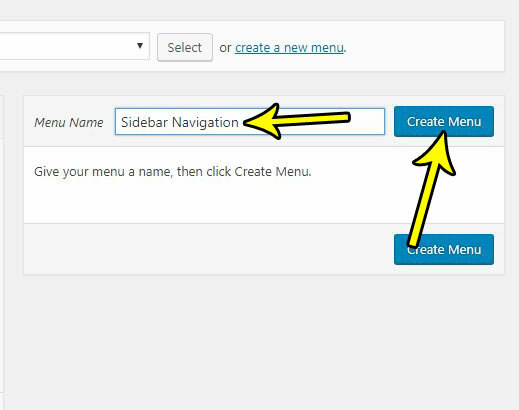 The steps in this article will show you how to create a new menu in WordPress. You will be giving a name to that menu, then adding some links to it. 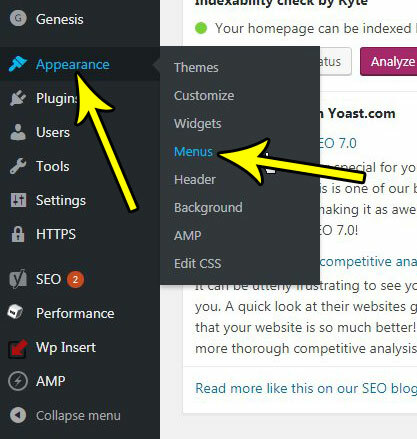 Ideally you should already have at least a couple pages and possibly some posts and categories already created so that you can add them to the menu. Step 1: Sign into the admin section of your WordPress site. This is found at yourwebsite.com/wp-admin, but replacing the “yourwebsite.com” part with the domain of your site. Step 2: Click the Appearance tab at the left side of the window, then choose the Menu option. 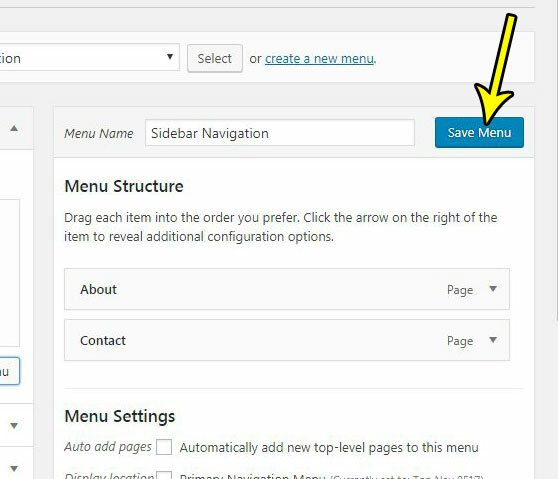 Step 3: Click the create a new menu link near the top of the menu. Step 4: Type a name for the menu into the Menu Name field, then click the Create Menu button. 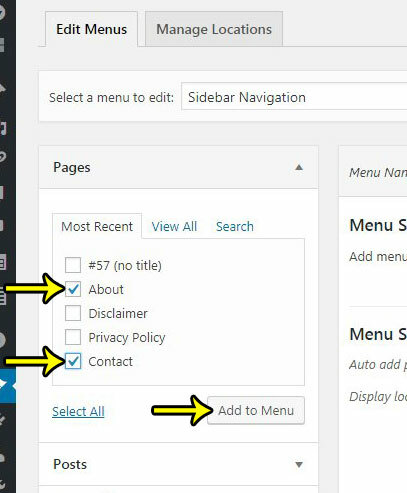 Step 5: Check the box next to the left of each page, post, category, or other link that you wish to include in the menu, then click the Add to Menu button. Step 6: Click the Save Menu button when you have finished adding links. Note that you can click on links in the menu and drag them to different locations if you want to change the order. Step 7: Click the Manage Locations tab at the top of the window. Step 8: Click the dropdown menu next to the menu location that you wish to use, select the menu that you just created, then click the Save Changes button. Note that most themes are going to have different options for menu locations, so it’s very likely that your options will look different than the ones below. 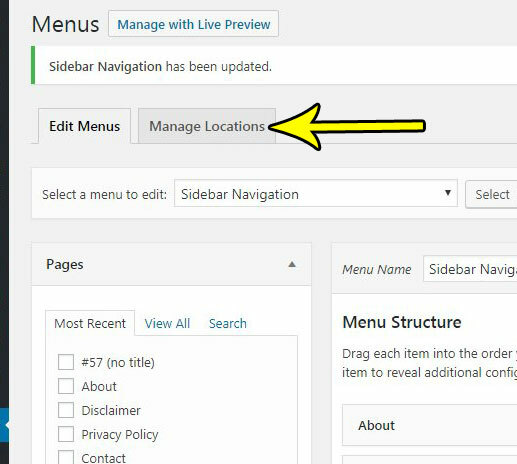 Sometimes the menu location descriptions aren’t helpful, either, so you may need to test around with different locations until the menu winds up in the right spot. If you are creating this menu before you have written any of your content, or decide how you want to organize your content, then you may want to create some post categories. This provides an easy way for you to place your new posts into different archives where it will be easier for your readers to locate them.